Rhode Island boatbuilder Blount Boats said it has signed a contract with South Ferry Company to construct a new steel passenger/vehicle ferry for Shelter Island, N.Y. 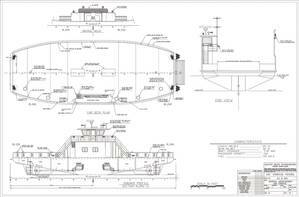 The 101'x 40' double-ended ferry, to be named Southern Cross, will be built to carry a deck load of 260,000 pounds. The vessel will be a sister ship to two other Blount-built ferries designed by DeJong & LeBet for South Ferry, the Sunrise delivered in 2002 and the Southside delivered in 2009. Main propulsion will be provided by two Caterpillar series C-18 Tier III & IMO II Certified each rated at 470 HP at 1,800 RPM. Twin Disc MG-516 remote mount, reverse gears will transmit power to four-blade, nibral ice strengthened propellers through 4' Aquamet 22 propeller shafts. The Clark family, owners of South Ferry Company, have been providing transportation between Shelter Island and Long Island's southern fork since the 1700s. The operator runs ferries year-round every 10-15 minutes to and from North Haven, N.Y. The short crossing takes just minutes to complete. KNUD E. HANSEN has announced a new partnership with Danish-based Design Studio B33.